Made of heavyweight pressboard material for extra durability. Use different colors for different types of projects. 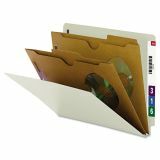 Smead Pressboard End Tab Classification Folder, Pockets, Letter, Six-Section, 10/Box - Full page-size pockets style dividers hold papers, computer disks or other small items. 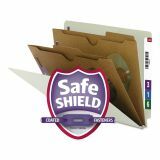 Folder's sturdy 25 point stock contains 75 percent recycled material and 25 percent post-consumer material. Plain, straight-cut tab is 1/2" wide. The 2" prong K style fasteners are in positions one and three. 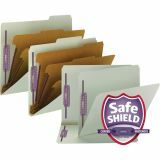 Pocket Dividers feature 11 point kraft stock with double ply tabs that are 1/2" high, 1/3 cut. The 1" prong B style fasteners are installed front and back. SFI Certified.